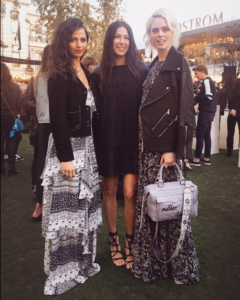 New York-based designer Rebecca Minkoff moved her New York Fashion Week Winter show to Los Angeles. In a move repeated from Fall NYFW, Minkoff created an outdoor runway. The show, which took place at the Grove, was filled with customers, models and celebrities eager to see the designers Fall ’17 looks. Lauren Conrad and Keke Palmer were among celebrities who attended the show. Minkoff added a see-now-buy-now spin to the show, allowing customers to purchase the fashion immediately after the presentation. The show was filled with lots of custom tee’s, short skirts, dresses and a large selection of Rebecca Minkoff’s signature handbags. There was an array of colors and plenty of white and light colors used to create the fashion. Monica Link is a New York City-based Fashion/ Tech writer, performer and entrepreneur. Learn more about her at www.Monicalink.info.